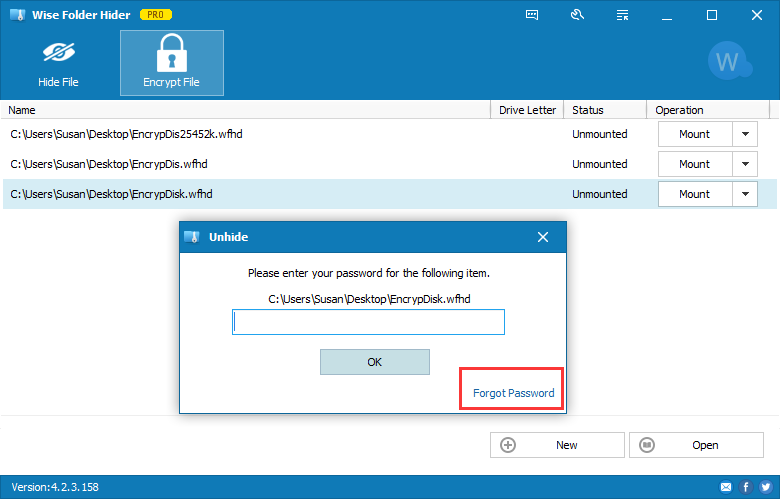 Wise Folder Hider Pro is the advanced version of Wise Folder Hider Free, you can not only use Free hidden function but also can use encryption feature, quickly hide and encrypt important files and folders to protect your personal files (documents, photos, videos, mails, etc.) to prevent being seen and opened by others. 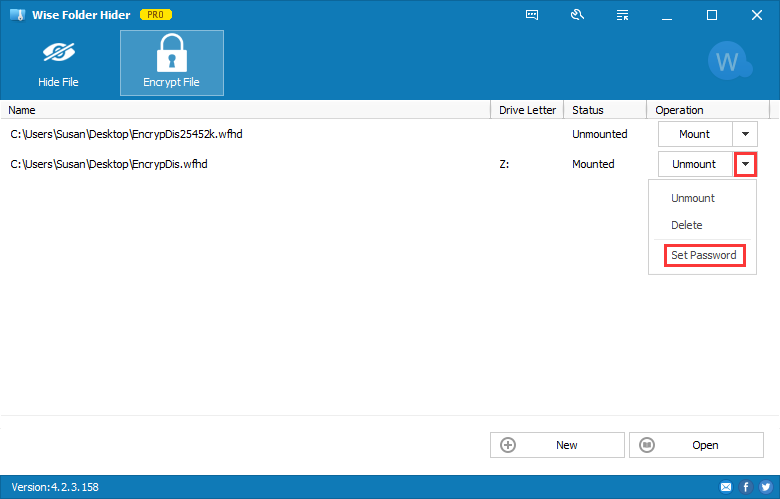 Wise Folder Hider is an easy to use Windows file and folder encryption tool. 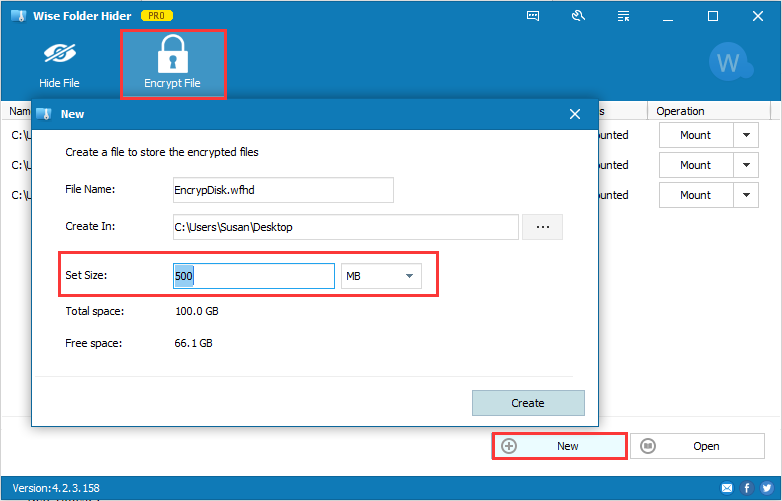 To be able to encrypt a file, Wise Folder Hider Pro will be asking you to create a locker first. Under "Encrypt File" tab, click on "New" at the lower right corner. In the popped up window, you can customize File name, Location, and Size. Set size to enable a free enough space is remarkable. As soon as generated successful, an empty folder would spread out for copy and paste what you are going to take seriously. Normally it would be a "Drive Z" mounted to your disk. Then, close this folder and click drop-down arrow to choose Unmount, drive Z will disappear from Windows explorer. 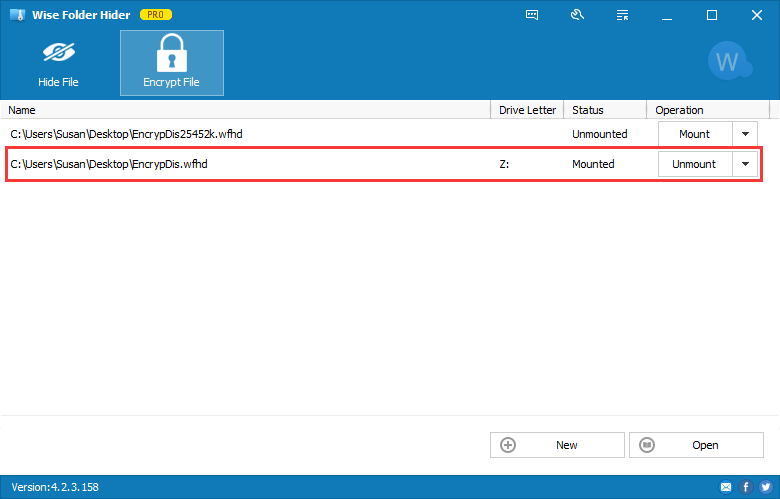 Files and folders have been encrypted successfully after you close Wise Folder Hider. You can set a password to the generated locker by clicking Set Password in the drop-down menu. A strong password can make the locker much safer, especially you shift a locker to a removable storage device. If you forgot the password, do not worry, please click the lower right corner "Forgot Password" to reset a new one. The password reset link will be sent to your registered email address after you click "Forgot Password" button. To sum up, it is just so simple to use Wise Folder Hider to protect your files and folders from the spying eyes. I forget my login password, how can I retrieve it? If I forget the second password, how can I retrieve it? If I accidentally uninstall Wise Folder Hider Pro, can I get back my hidden files? Can I install Wise Folder Hider Pro without uninstalling the Free version?